Last week I was fortunate enough to be able to join a team of doctors going to Ha Giang (in northwest Vietnam) to carry out surgeries on children from the mountain, supported by Child Surgeries Vietnam and HIWC. Not only was this an amazing trip from the point of view of the surgeries but it also gave me the opportunity to suss out first hand the journey to Ha Giang — an oft considered difficult place to reach. I can now confirm that it’s not so bad. Sure, there aren’t any flights and there aren’t any trains, but it’s only an eight-hour bus journey and the roads are fine. Yes, they’re a bit bumpy — don’t expect much sleep — and you’ll face the usual traffic hazards, along with a few steep drops, but I’ve seen worse. Buses for Ha Giang mainly leave from My Dinh bus station and there are morning and evening (sleeper) departures. As well as very early morning public buses, private operators ply the route. For example, Hung Thanh runs from My Dinh, Luong Yen and Gia Lam, with tickets priced at 180,000VND. It’s best to book at least a few hours or a day in advance, although the latter option isn’t too practical given the cost of travelling to My Dinh; consider paying extra for a travel agent to sort the tickets out for you or try booking online. I’d recommend travelling up during the day and spending the night in Ha Giang before heading off to do whatever you want to do in the region the next morning. You can then travel back overnight. By travelling during the day you get to enjoy the scenery on the way up: while much of the journey is through towns and villages, as you get higher the population gets sparser, the paddy gives way to tea plantations and there are glimpses of the real beauty awaiting you further up. The time flies by as you stare out of the window, lost in thought … until the bus hits a bumpy bit of road or the driver brakes suddenly to avoid an oncoming cow. A rest stop en route. Then on the return journey you get the pleasure of the sleeper bus experience. Having tried to avoid doing this again for as long as possible, I was actually quite excited about cramming myself into a short seat / bed. I shouldn’t have been. While it certainly wasn’t a real hardship, it really is difficult to get comfy and a sleepless night is pretty much guaranteed for the light sleepers among us. Fortunately I had two “seats” to myself, which made it more bearable. One thing to note: if buses get in before 05:00 they park up at My Dinh and everyone stays asleep on the bus. 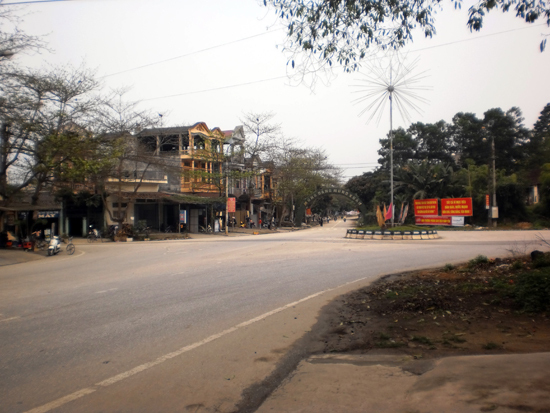 I wasn’t sure we were even in My Dinh, so I hung around for an hour until I realised we must be there and got off. The reason for this? Local buses don’t start running until after 05:00 so most people want to wait until they start. You don’t have to — there are plenty of taxis and xe oms around. The bus station in Ha Giang is at 5 Nguyen Trai Street and buses depart hourly in the morning from 05:00 until 12:00 and in the evening at 20:00, 20:30, 21:00 and 21:30. If you don’t want to go by bus, you have two other options: you can hire a car or minibus and driver, but this is expensive (we were quoted $320 return for a car), or you can go by motorbike. As I said, the roads aren’t bad, but it’s still 315 kilometres, which in northwest Vietnam is still a long, long way — budget at least two days to get there. 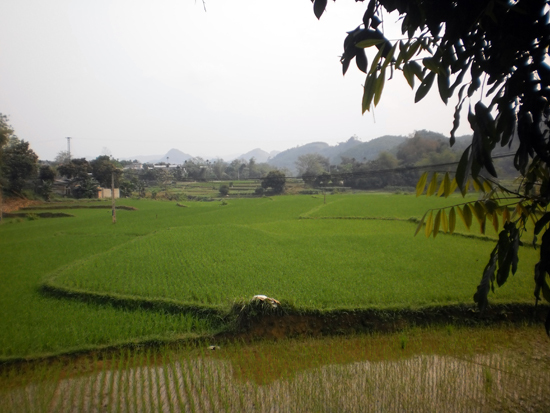 Plus, Ha Giang is really only the start point for the journey: the real attraction lies north of there. If you’re planning on doing a round trip by motorbike from Ha Giang, I’d recommend you take the bus up and hire bikes from Ha Giang (more on that to come). If you’re aiming to go to Ha Giang and then over to northeast Vietnam, for example, then consider taking the train back from Lao Cai to Hanoi. Of course, if you have heaps of time and love driving, why not go the whole hog?